I was a child when fluoride, a by-produce from the manufacture of the atomic bomb, was first introduced to the American people. Nobody told us where fluoride came from. All we knew is that it was a wonderful new product that would make our teeth extra hard and prevent cavities. When a free fluoride clinic was set up one summer in our school, all the kids in town were lined up to have this bitter tasting stuff rubbed all over our teeth. We were pretty gullible in those days. The war years and the period immediately following the war was a time of great scientific advancement, when people were lulled into the belief that science was going to solve all of the problems of the world. The belief was so strong that we believed whatever a scientist told us. Nobody dreamed that we might be victims of a fraud. My father was part of the magic. He worked as a chemical engineer for a local plant that manufactured a variety of products from wheat and corn starch (including the brain-killing excitotoxin mono-sodium glutamate). Consequently, he provided well enough during the war years that I made regular visits to a dentist every summer. I knew well the agony of the dentist drill, which was nothing like the advanced water-cooled high speed equipment used by modern dentists. Repairing a cavity doomed us to what seemed like hours of white-knuckle torture under the glaring lights of the dental chair, while a man with plastic rimmed glasses and bad breath bored his way through our teeth. Once the drilling was done, the dentist filled the hole he made with a hot metallic material that burned when it went in, and left a bad taste in your mouth. Even though my mother made sure that I brushed my teeth daily, I don't remember linking the candy I was eating to all of the cavities. Once fluoride was introduced, it seemed like a child's dream come true. I was disappointed, of course. I discovered that I had just as many cavities in my teeth the following year. When they started dumping fluoride in the local water supply, and adding it to the ingredients in our toothpaste, I thought that would solve my problem. It seemed reasonable to think that I didn't get a heavy enough dose of fluoride when I attended the free clinic. After all, if a little bit of fluoride was good for your teeth, think what a lot of exposure could do. But alas, after years of drinking, scrubbing and consuming fluoride laced products, we are discovering that we've been scammed. This chemical is found to be totally ineffective in preventing tooth decay. Not only that, it seems to be directly linked to a variety of medical problems ranging from discolored teeth to bone disease and cancer. This is not news to the medical world. The Journal of the American Medical Association and the New England Journal of Medicine have both reported greater incidence of hip fractures in fluoridated areas. The National Institute of Environmental and Health Services has directly linked fluoridation with cancer. A book by Dr. John Yiamouyiannis titled "Fluoride, The Aging Factor," claims that the drug also causes a premature aging process. The author notes that in areas where fluoride is consumed in the drinking water, there are higher rates of bone disorders (skeletal fluorosis, osteoporosis and arthritic pain) and people suffer from brown decaying teeth. "Fluoride interacts with the bonds which maintain the normal shape of proteins," he continues. "With distorted protein, the immune system attacks its own protein, the body's own tissue." The visual and physical effects from prolonged exposure to fluoride include nausea, bloody vomit, faintness, stomach cramps, tremors, constipation, aching bones, stiffness, skin rash, weight loss and brown or black discoloration of the teeth. 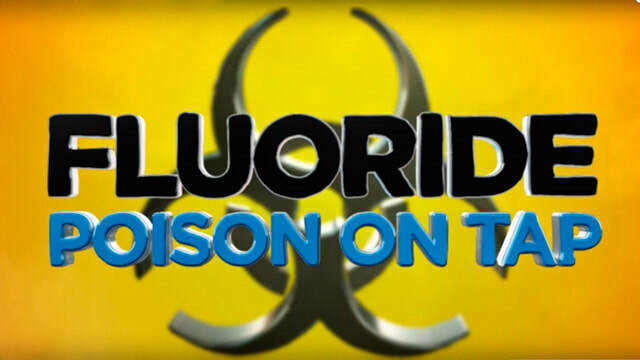 The horror in this story is that fluoride was known as a deadly poison from the start. But if this is true, why would we expose a nation, and now people all over the world, to it? Would you believe the answer to that question is money? There is compelling evidence that the program of water fluoridation began as a massive effort to cover up one of the most toxic materials to emerge from the government's secret nuclear weapons program. The idea was that if fluoride could be presented to the country as beneficial, then no one could sue the government for being harmed by it. They found that fluoride was a key chemical in atomic bomb production. Millions of tons were used during the Cold War period to manufacture high-grade uranium and plutonium. This secret work to head-off government lawsuits led to a multi-billion dollar industry that has been poisoning our water supplies, our toothpaste, and our bodies ever since. Believe this or not, fluoride tablets have even been made available for children.